"9/11 Memorial" redirects here. For other uses, see Memorials and services for the September 11 attacks. The National September 11 Memorial & Museum (also known as the 9/11 Memorial & Museum) is a memorial and museum in New York City commemorating the September 11, 2001 attacks, which killed 2,977 people, and the 1993 World Trade Center bombing, which killed six. The memorial is located at the World Trade Center site, the former location of the Twin Towers that were destroyed during the September 11 attacks. It is operated by a non-profit institution whose mission is to raise funds for, program, and operate the memorial and museum at the World Trade Center site. Memorial: The footprints of the Twin Towers are underground. Museum: Pavilion is from 66 to 75 feet (20 to 23 m) high. A memorial was planned in the immediate aftermath of the attacks and destruction of the World Trade Center for the victims and those involved in rescue and recovery operations. The winner of the World Trade Center Site Memorial Competition was Israeli architect Michael Arad of Handel Architects, a New York- and San Francisco-based firm. Arad worked with landscape-architecture firm Peter Walker and Partners on the design, creating a forest of swamp white oak trees with two square reflecting pools in the center marking where the Twin Towers stood. In August 2006, the World Trade Center Memorial Foundation and the Port Authority of New York and New Jersey began heavy construction on the memorial and museum. The design is consistent with the original master plan by Daniel Libeskind, which called for the memorial to be 30 feet (9.1 m) below street level—originally 70 feet (21 m)—in a plaza, and was the only finalist to disregard Libeskind's requirement that the buildings overhang the footprints of the Twin Towers. The World Trade Center Memorial Foundation was renamed the National September 11 Memorial & Museum in 2007. A dedication ceremony commemorating the tenth anniversary of the attacks was held at the memorial on September 11, 2011, and it opened to the public the following day. The museum was dedicated on May 15, 2014, with remarks from Michael Bloomberg and President Barack Obama. The museum opened to the public on May 21. In September 2007 the Memorial & Museum began a four-month national-awareness tour of 25 cities in 25 states, and thousands participated in tour activities. The tour began at Finlay Park in Columbia, South Carolina, ending at Steinbrenner Field in Tampa, Florida. Highlights included an exhibition of photographs, artifacts from the site and a film with firsthand accounts from individuals who had directly experienced the attacks. At the opening ceremony in South Carolina, the students of White Knoll Middle School (who raised over $500,000 in 2001 for a new truck for the New York City Fire Department) were honored and retired New York City police officer Marcelo Pevida presented the city with an American flag which had flown over Ground Zero. The main attractions of the 2007 national tour were steel beams, later used in the construction of the memorial, for visitors to sign. The National September 11 Memorial & Museum conducts a "cobblestone campaign", in which a contributor may sponsor a cobblestone which will line the Memorial plaza. Donors are recognized on the Memorial's website. Donors are able to locate their cobblestone by entering their name at a kiosk on the Memorial plaza. In 2008 the Memorial conducted two holiday cobblestone campaigns: the first for Father's Day, and the second for the December holiday season. On September 9, 2011, Secretary Shaun Donovan of the United States Department of Housing and Urban Development said that the department had given $329 million to the National September 11 Memorial & Museum through HUD's Community Development Block Grant program. According to CNN, the Port Authority of New York and New Jersey dropped its claim that the 9/11 Memorial & Museum owed it $300 million in construction costs in return for "financial oversight of the museum and memorial". Senator Daniel Inouye of Hawaii sponsored S.1537, the National September 11 Memorial and Museum Act of 2011, which would provide $20 million in federal funds annually toward the Memorial's operating budget (about one-third of its total budget). The legislation was presented to the U.S. Senate Committee on Energy and Natural Resources on October 19, 2011. In return for federal funding S.1537 would authorize the Secretary of the Interior to accept the donation by the memorial's board of directors of title to the National September 11 Memorial, contingent on agreement by the board, the governors of New York and New Jersey, the Mayor of New York and the Secretary of the Interior. On October 19, 2011 William D. Shaddox of the National Park Service voiced concerns to the Senate Committee on Energy and Natural Resources about the agency's ability to provide the funds required by S.1537, testifying that NPS ownership of a property over which it would not have operational and administrative control (as stipulated by S.1537) was unprecedented. Formerly the World Trade Center Memorial Foundation, the National September 11 Memorial & Museum was formed as a 501(c)(3) non-profit corporation to raise funds and manage the memorial's planning and construction. Its board of directors met for the first time on January 4, 2005, and it reached its first-phase capital-fundraising goal ($350 million) in April 2008. This money and additional funds raised will be used to build the memorial and museum and endow the museum. In 2003, the Lower Manhattan Development Corporation launched the World Trade Center Site Memorial Competition, an international competition to design a memorial at the World Trade Center site to commemorate the lives lost on 9/11. Individuals and teams from around the world submitted design proposals. On November 19, 2003, the thirteen-member jury selected eight finalists. 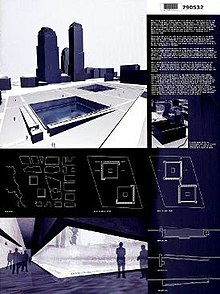 Reflecting Absence, designed by Michael Arad and Peter Walker, was chosen as the winning design on January 6, 2004. 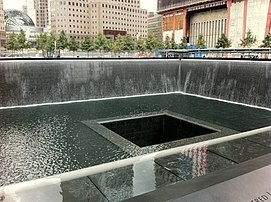 It consists of a field of trees interrupted by two large, recessed pools, the footprints of the Twin Towers. The deciduous trees (swamp white oaks) are arranged in rows and form informal clusters, clearings and groves. The park is at street level, above the Memorial Museum. The names of the victims of the attacks (including those from the Pentagon, American Airlines Flight 77, United Airlines Flight 93, and the 1993 World Trade Center bombing) are inscribed on the parapets surrounding the waterfalls in an arrangement of "meaningful adjacencies". A portion of the slurry wall originally designed to hold back the Hudson River, about half of what Daniel Libeskind originally wanted to preserve, is maintained in the museum. On January 14, 2004, the final design for the World Trade Center site memorial was unveiled at a press conference in Federal Hall National Memorial. The decision was made to not actively pursue new fund-raising efforts until complete clarity can be achieved with respect to the design and costs of the project. Cost concerns emerged publicly last week with the disclosure of an estimate by the construction manager, Lend Lease Group, that the memorial and museum would cost $672 million and that it would take a total of at least $973 million to fully develop the memorial setting with a cooling plant, roadways, sidewalks, utilities and stabilized foundation walls. An estimate earlier this year put the cost of the memorial and memorial museum at $494 million. On May 26, 2006, Gretchen Dykstra resigned as president and chief executive officer of the World Trade Center Foundation. Joseph C. Daniels was appointed as president and CEO in October 2006. The memorial projects were toned down, and the budget was cut to $530 million. Construction of the memorial began in August 2006 and, despite delays, the National September 11 Memorial & Museum was confident that it would be completed by September 11, 2011. On March 13, 2006, construction workers arrived at the WTC site to begin work on the Reflecting Absence design. Some relatives of the victims and other concerned citizens gathered to protest the new memorial that day, saying that it should be built above ground. The president of the memorial foundation said that family members were consulted and formed a consensus in favor of the design, and work would continue as planned. In May, estimated construction costs for the Memorial were reported to have risen to over $1 billion. Mayor Michael Bloomberg said, "There's just not an unlimited amount of money that we can spend on a memorial. Any figure higher than $500 million would be inappropriate." In 2006, at the request of Bloomberg and Governor George Pataki, builder Frank Sciame performed a month-long analysis which included input from victims' families, the lower Manhattan business and residential communities, architects and members of the memorial-competition jury. The analysis recommended design changes which kept the memorial and museum within a $500 million budget. 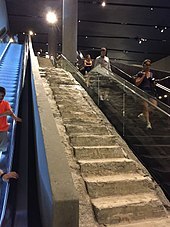 In July 2008, the Survivors' Staircase was lowered to bedrock, making it the first artifact to be moved into the museum. By the end of August, the footings and foundations were completed. On September 2 construction workers raised the 7,700-pound (3,500 kg) first column for the memorial, near the footprint of the North Tower. By then, about 70 percent of the construction contracts were awarded or ready to award. A total of 9,100 short tons (8,300 t) of steel were installed at the memorial site. By April 2010 the reflecting pools were fully framed in steel, and 85 percent of the concrete had been poured. By April 22, workers had begun installation of the granite coating for the reflecting pools. By June the North Pool's granite coating was completed, and workers had begun granite installation in the South Pool. In July, the first soil shipments arrived at the site, and in August workers began planting trees on the memorial plaza. The swamp white oaks can reach 60 to 80 feet (18 to 24 m) at maturity, live from 300 to 350 years, and their autumn leaves are gold-colored. The "Survivor Tree" is a callery pear which survived the devastation and was kept for replanting. In September, workers reinstalled two tridents salvaged from the Twin Towers. In November 2010, workers began testing the North Pool waterfall, and construction progressed through early 2011. In March installation of glass panels on the museum pavilion's façade began, and in May workers began testing the South Pool waterfall. Most of the memorial was finished in time for the 10th anniversary of the terrorist attacks, with the museum planned for completion one year later. By September 2, 243 trees were planted at the site and eight more were planted in the days before the memorial opened. By then, both pools were completed and the waterfalls were tested daily. On September 12, 2011, one day after the 10th anniversary of the September 11 terrorist attacks, the memorial opened to the public with a lengthy set of rules and regulations approved by the foundation's board of directors. The period from September 11, 2011 to May 25, 2014 was known as the "interim operating period", when the memorial was surrounded by construction of neighboring World Trade Center projects; the fence was taken down on May 25, 2014. Three months after its opening, the memorial had been visited by over a million people. In January 2004, Reflecting Absence, by architect Michael Arad and landscape architect Peter Walker, was selected from 5,201 entries from 63 countries as the winner of the LMDC's design competition. 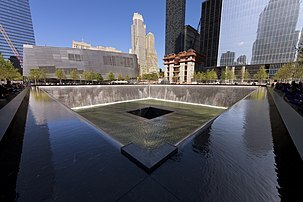 Two 1-acre (4,000 m2) pools with the largest man-made waterfalls in the United States comprise the footprints of the Twin Towers, symbolizing the loss of life and the physical void left by the attacks. The waterfalls are intended to mute the sounds of the city, making the site a contemplative sanctuary. Landscape architect Peter Walker planted many parts of the memorial with white oaks. More than 400 swamp white oak trees fill the Memorial plaza, enhancing the site's reflective nature. Pedestrian simulations tested the memorial's design. The pedestrian-modeling program Legion was used to simulate visitor utilization of the space, and its design was tweaked to prevent bottlenecks. The fountain was engineered by Delta Fountains. The names of 2,983 victims are inscribed on 152 bronze parapets on the memorial pools: 2,977 killed in the September 11 attacks and six killed in the 1993 World Trade Center bombing. The names are arranged according to an algorithm, creating "meaningful adjacencies" based on relationships—proximity at the time of the attacks, company or organization affiliations (for those working at the World Trade Center or the Pentagon) and in response to about 1,200 requests from family members. Software by Local Projects implemented the arrangement. The process for arranging the names was finalized in a 2006 agreement, replacing an earlier plan to arrange the names randomly. According to Edith Lutnick (executive director of the Cantor Fitzgerald Relief Fund), "Your loved ones' names are surrounded by the names of those they sat with, those they worked with, those they lived with and, very possibly, those they died with." 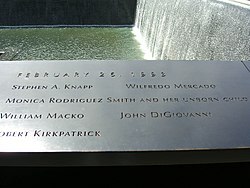 The six adult victims of the 1993 bombing are memorialized on Panel N-73 at the North Pool. 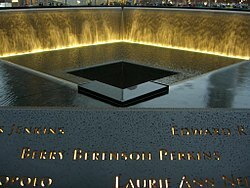 The phrase "and her unborn child" follows the names of ten pregnant women who died on 9/11 and one who died in the 1993 attack. 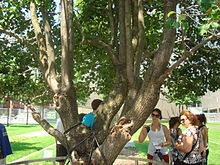 A callery pear tree recovered from the rubble at the World Trade Center site in October 2001 was later called the "Survivor Tree". When the 8-foot (2.4 m)-tall tree was recovered, it was badly burned and had one living branch. The tree had been planted during the 1970s near buildings four and five, in the vicinity of Church Street. Then-Memorial president Joe Daniels described it as "a key element of the memorial plaza's landscape". In November 2001, the tree was moved by the New York City Department of Parks and Recreation to the Arthur Ross Nursery in Van Cortlandt Park in the Bronx for care. It was then replanted in the Bronx on November 11, 2001. The tree was not expected to survive, but it showed signs of new growth the following spring. Although the memorial planning team intended to include the Survivor Tree, its permanent location was unknown at the time. Still under the care of the Bronx nursery, the tree was replanted without significant damage in March 2010 after it was uprooted by a storm. After the replanting, Mayor Michael Bloomberg said: "Again, we and the tree refused to throw in the towel. We replanted the tree, and it bounced back immediately." The Survivor Tree has become a symbol of hope and rebirth; according to Arthur Ross Nursery manager Richie Cabo, "It represents all of us." In an August 29, 2011 Port Authority press release (after Hurricane Irene), Daniels said: "True to its name, the Survivor Tree is standing tall at the Memorial." Keating Crown (a survivor of the attacks) said, "It reminds us all of the capacity of the human spirit to persevere." A Place of Remembrance: Official Book of the National September 11 Memorial describes the tree as "a reminder of the thousands of survivors who persevered after the attacks". In December 2010, the tree, then 30 feet (9.1 m) tall, was returned to the World Trade Center site in a ceremony attended by Bloomberg, city officials (including Parks and Recreation Commissioner Adrian Benepe and Port Authority executive director Chris Ward), survivors and rescue and recovery workers. Although the tree is a prominent part of the memorial, six other "survivor trees" have been planted near New York City Hall and the Manhattan end of the Brooklyn Bridge. Of these survivor trees, three are callery pears and three are little-leaf lindens. In May 2018, plans were revealed for a path through a "memorial glade" at the National September 11 Memorial. The path will honor first responders who later got sick or died after inhaling toxins at the World Trade Center site. According to 9/11 Memorial & Museum president Alice Greenwald and former Daily Show host Jon Stewart, the path will be located on the southwest side of the memorial plaza, at the approximate site of a temporary ramp that first responders used during the cleanup effort. The path will include six large battered stones that, in the words of Michael Arad, "appear to jut up and out of the plaza as if violently displaced, and convey strength and resistance". Several pieces of debris from the original World Trade Center will also be placed along the path. Although victims'-family groups agreed that names would be grouped by workplace or other affiliation, NYPD cadet Mohammad Salman Hamdani was not included with the other first responders or the other victims whose remains were found in the wreckage of the North Tower. 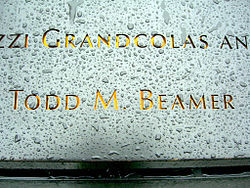 His name appears on the memorial's panel 66 for World Trade Center victims (next to a blank space along the South Tower perimeter), with those who did not fit into the groups created by the memorial committee or who had a loose connection to the World Trade Center. Hamdani's mother, Talat, has campaigned for the Memorial to acknowledge her son as a police cadet and first responder. Hamdani received a full police-department funeral after his body was found (months after the attacks), and the street on which he lived was renamed in his honor. Although the memorial's brochures were initially translated into at least ten languages, these languages did not include Arabic. The American-Arab Anti-Discrimination Committee (ADC) questioned this decision in letters to memorial directors, and ADC director of communications and advocacy Raed Jarrar said: "Our fear is that there is a political intention behind the exclusion". A memorial representative told the New York Post, "As Arabic-speaking visitors currently represent our 25th-largest group, Arabic translations are not yet among the initial foreign-language editions." 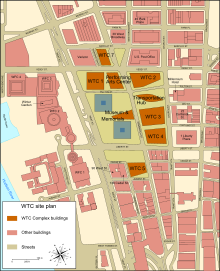 In 2015, the American-Arab Anti-Discrimination Committee made an official complaint with the U.S. Department of Housing and Urban Development, which had given hundreds of millions of dollars in grants to the September 11 Memorial through block grants to the Lower Manhattan Development Corporation. The committee stated that the Memorial's decision to not publish Arabic-language brochures violated HUD's Limited English Proficiency rules for grantees. In December 2017, the ADC announced that the Memorial had signed a settlement agreement whereby its commemorative guide would be translated into Arabic and made available. The September 11 Museum was dedicated on May 15, 2014, and opened to the public on May 21. Its collection includes more than 40,000 images, 14,000 artifacts, more than 3,500 oral recordings, and over 500 hours of video. The underground museum has artifacts from September 11, 2001, including steel from the Twin Towers (such as the Last Column, the last piece of steel to leave Ground Zero in May 2002). In December 2011, museum construction halted temporarily due to disputes between the Port Authority of New York and New Jersey and the National September 11 Memorial and Museum Foundation over responsibility for infrastructure costs. On March 13, 2012, talks on the issue began, and construction resumed on September 10, 2012. After a number of false opening reports, it was announced that the museum would open to the public on May 21, 2014. The museum was dedicated on May 15, 2014. In attendance were a range of dignitaries, from President Barack Obama, former President Bill Clinton, former Secretary of State Hillary Clinton and New York Governor Andrew Cuomo to former mayors David Dinkins, Rudy Giuliani and Michael Bloomberg and current mayor Bill de Blasio. During the hour-long ceremony LaChanze sang "Amazing Grace", which she dedicated to her husband Calvin Gooding, who was killed in the World Trade Center attack. During the five days between its dedication and the public opening, over 42,000 first responders and family members of 9/11 victims visited the museum. An opening ceremony for the museum was held on May 21, during which twenty-four police officers and firefighters unfurled the restored 30-foot (9.1 m) national 9/11 flag before it was brought into the museum for permanent display. The gates surrounding the museum were then taken down, marking their first removal since the attacks. Opening-day tickets quickly sold out. Despite the museum's design (to evoke memories without additional distress), counselors were available during its opening due to the large number of visitors. Designed by Davis Brody Bond, the museum is about 70 feet (21 m) below ground and accessible through a pavilion designed by Snøhetta. The National September 11 Memorial Museum encloses 110,000 square feet (10,000 m2) of publicly accessible space. The pavilion has a deconstructivist design, resembling a partially collapsed building (mirroring the attacks), and houses two tridents from the Twin Towers. One of the museum's walls is an exposed side of the slurry wall retaining the Hudson River, which remained intact during (and after) September 11. Other Ground Zero artifacts include wrecked emergency vehicles (including a fire engine deformed from the collapse), pieces of metal from all seven World Trade Center buildings, recordings of survivors and first responders (including 911 phone calls), pictures of all victims, photographs from the wreckage and other media detailing the destruction (including the crashes, collapse, fires, those who jumped and the cleanup). The museum is designed to evoke memories without additional distress, particularly to first responders and the families of victims. The Huffington Post wrote that "walking through the museum is like being transported back to the turmoil, destruction and anguish of 9/11. Exhibits express the disbelief and heartache of New York and the nation." The World Trade Center site was once part of Little Syria, the center of Arab life in the United States since the 1880s. The cornerstone of St. Joseph's Lebanese Maronite Church was found under the rubble, next to St. Nicholas Greek Orthodox Church at 157 Cedar Street. 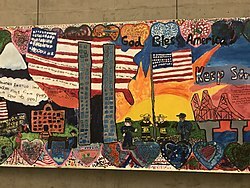 Local historians and preservationists have requested that the National September 11 Museum include a reference to this history in the Museum's permanent exhibit to "help the thousands of tourists who visit the site to understand that Arab-Americans have played a patriotic role in the country's history". According to the New York Daily News, a museum spokesperson said that its "curators are not planning to include information about the area's Arab-American history in the museum's permanent collection." "Save Washington Street" advocates had approached the museum after hearing there would be a display about the construction of the World Trade Center site and the demolition of Radio Row, the electronic district cleared to make way for the towers. They have also articulated the need for recalling the multiethnic character of "Little Syria", along with the Downtown Community House that served it, as extremely important for the historical memory of New York City and of the United States. General admission tickets to the museum are $24, a price which has raised concerns. Michael Bloomberg agreed, encouraging people to "write your congressman" for more federal funding. When the museum opened to victim families and first responders on May 15, 2014, anger by some that it was profiting from souvenirs considered in poor taste was widely covered. Souvenir proceeds would fund the museum and memorial. On May 29, 2014, a U.S.-shaped cheese platter was among items removed for sale, and it was announced that all items sold would be reviewed by victim families for suitability. Families were further angered after a May 20, 2014 black-tie, VIP cocktail party for donors at the museum. Among the 60 attendees were former mayor Michael Bloomberg and representatives of Condé Nast. Family members objected to a party near unidentified remains; the sister of victim Robert Shay, Jr. tweeted, "Did you enjoy having drinks on top of my brother's grave last night?" Shay and dozens of other visitors were angered that first responders were turned away from the museum the previous day while staff prepared for the party. She said, "I am outraged that I can't visit my brother's final resting place without an appointment but people like Mike Bloomberg can wine and dine there whenever they want. This memorial and museum is sacred ground and last night it was desecrated." A retired FDNY fire marshal said, "You don't have cocktail parties at a cemetery." A mid-2014 proposal to open a Danny Meyer cafe in the museum's atrium was criticized. In an early-morning ceremony on May 10, 2014, the long-unidentified remains of 1,115 victims were transferred from the city medical examiner to Ground Zero, where they would be placed in a space in the bedrock 70 feet (21 m) below ground as part of the 9/11 Memorial Museum. Reaction from the victims' families to the move was divided, with some supporting the decision and others calling the location inappropriate. 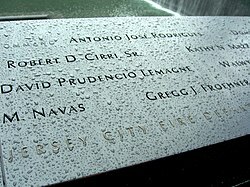 Among the latter was FDNY Lt. James McCaffrey, the brother-in-law of 9/11 victim and firefighter Orio Palmer, who called a ground-level tomb a more dignified location: "The decision to put the human remains of the 9/11 dead in this basement is inherently disrespectful and totally offensive." McCaffrey said that the remains deserved a prominence equal to that of the Memorial's trees and pools, and that the ceremony was held early in the morning because of opposition to the decision. The International Freedom Center – a think tank intended to draw attention to battles for freedom throughout history. 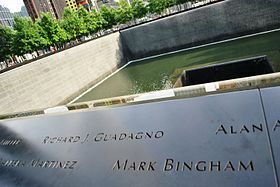 World Trade Center Memorial Foundation member Deborah Burlingame wrote in The Wall Street Journal that the center would have a mission with no direct connection to the events of September 11 and might criticize American policy. Right-wing blogs and commentators heavily criticized the center until Governor George Pataki withdrew support for it. The Drawing Center Art Gallery at the World Trade Center – an art gallery that was in SoHo at the time. Plans called for the Freedom Center to share space with the Drawing Center in a building known as the Cultural Center. Of the dispute over the proposed centers, one New York Times editorial stated not only that the IFC's opponents make trivial and unconvincing suggestions that both the IFC and the "cultural component" of architect Daniel Libeskind's plans would somehow diminish the scope of the Memorial Museum, but also that the proposal for reducing the size of one of the centers had failed to consider the emotional impact of the space. South Pool with construction of the museum, April 2012. Tower 3, Tower 4, and Tower 7 are in the background. South Pool at night; panel S-17, showing the name of Peter J. Ganci, Jr. In addition to the one at Ground Zero, a number of other memorials have been built by communities across the United States. Many are built around remnants of steel from the Twin Towers which have been donated by a Port Authority of New York and New Jersey program; over 1,000 pieces of World Trade Center steel have been distributed. ^ a b "Long delayed Sept 11 Memorial Museum inaugurated by Obama". United States News.Net. Archived from the original on May 17, 2014. Retrieved May 15, 2014. ^ a b c d "National September 11 Memorial Museum opens". Fox NY. May 21, 2014. Archived from the original on May 21, 2014. Retrieved May 21, 2014. ^ Dunlap, David W. (June 28, 2013). "In 9/11 Museum to Open Next Spring, Vastness and Serenity, and Awe and Grief". The New York Times. ^ Handwerker, Haim (November 20, 2007). "The politics of remembering Ground Zero". Haaretz – Israel News. ^ Schuerman, Matthew. "Trade Center Memorial Name Changes, Gets Longer | The New York Observer". Observer.com. Archived from the original on February 26, 2012. ^ Westfeldt, Amy (August 15, 2007). "9/11 memorial tour to stop in Charleston". The Charleston Gazette. Charleston, West Virginia: McClatchy-Tribune Information Services via HighBeam Research (subscription required). Archived from the original on May 18, 2013. Retrieved May 3, 2012. Previously known as the World Trade Center Memorial, the memorial's official name is now the National September 11 Memorial & Museum at the World Trade Center. The memorial debuted a new logo and Internet address Tuesday. ^ "NATIONAL SEPTEMBER 11 MEMORIAL & MUSEUM REACHES 25th CITY ON NATIONAL TOUR" (PDF). National September 11 Memorial and Museum at the World Trade Center. December 14, 2007. Retrieved September 13, 2012. ^ "National 9/11 Memorial & Museum Tour Kicks Off in South Carolina". Officer.com. October 5, 2012. Archived from the original on September 13, 2007. ^ "National September 11 Memorial & Museum Begins National Tour of Tribute Exhibition to Raise Awareness and Support" (PDF). National September 11 Memorial. Retrieved March 26, 2012. ^ "Cobblestone Donors". National September 11 Memorial. Retrieved March 21, 2012. ^ "Sponsor a Cobblestone". National September 11 Memorial. Retrieved March 21, 2012. ^ "NATIONAL SEPTEMBER 11 MEMORIAL & MUSEUM ANNOUNCES FATHER'S DAY COBBLESTONE GIVING CAMPAIGN" (PDF). National September 11 Memorial. Retrieved March 21, 2012. ^ "NATIONAL SEPTEMBER 11 MEMORIAL & MUSEUM ANNOUNCES HOLIDAY COBBLESTONE GIVING CAMPAIGN" (PDF). National September 11 Memorial. Retrieved March 21, 2012. ^ "How HUD Is Honoring the Victims of September 11th". United States Department of Housing and Urban Development. Retrieved April 21, 2014. ^ "Construction to resume on national 9/11 museum, Bloomberg and Cuomo say". CNN. Retrieved April 22, 2014. ^ "Bill Text 112th Congress (2011–2012) S.1537.IS". Thomas.loc.gov. ^ "Statement of William D. Shaddox". Archived from the original on August 1, 2012. Retrieved March 20, 2012. ^ a b c CNN Library (September 8, 2014). "Ground Zero Memorial and Rebuilding Fast Facts". CNN. Retrieved November 5, 2014. ^ "9/11 Memorial – Names Arrangement". Archived from the original on February 20, 2017. Retrieved December 15, 2018. ^ Dunlap, David W. (May 9, 2006). "9/11 Group Suspends Fund-Raising for Memorial". New York Times. 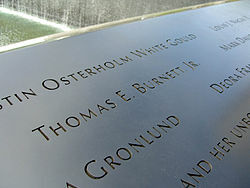 ^ "Gretchen Dykstra Resigns As Head Of WTC Memorial Foundation". NY1 News. May 26, 2006. Archived from the original on February 15, 2008. ^ "WTC Memorial Foundation Names Joseph C. Daniels as President & CEO of the Foundation" (PDF). October 31, 2006. Archived from the original (PDF) on October 25, 2007. Under Daniels' leadership, the project would successfully open on the 10-year anniversary of the 9/11 attacks. Daniels has shifted his focus on ensuring the opening of the 9/11 Memorial Museum. He directs planning, construction, development and operations for the historic project that is expected to draw millions of visitors each year. For the entire project, Daniels has helped in a fundraising campaign that exceeds $400 million dollars. ^ "9/11 memorial plans scaled down". BBC. June 21, 2006. ^ Perez, Luis (March 14, 2006). "WTC memorial construction underway". Newsday. Archived from the original on May 8, 2009. ^ Laura Trevelyan (March 13, 2006). "Work commences on 9/11 memorial". BBC. Retrieved May 19, 2010. ^ Melissa McNamara (May 5, 2006). "Sept. 11 Memorial Cost Jumps To $1B". CBS News. Retrieved May 21, 2014. ^ Karni, Annie (March 18, 2012). "Less than zero | New York Post". Nypost.com. Retrieved May 21, 2014. ^ "Sciame hints 9/11 names will move, museum may stay". Downtownexpress.com. Archived from the original on September 23, 2015. Retrieved May 21, 2014. ^ Dunlap, David W.; Bagli, Charles V. (June 21, 2006). "Revised Design for 9/11 Memorial Saves Many Features and Lowers Cost". The New York Times. Retrieved May 21, 2014. ^ "Steel column for 9/11 memorial rises at Ground Zero". Newsday. Melville, New York: Newsday Inc. Associated Press. August 17, 2008. Archived from the original on September 7, 2008. ^ "Steel Installation Begins for National September 11 Memorial & Museum at WTC Site" (Press release). Port Authority of New York and New Jersey. September 2, 2008. Archived from the original on May 16, 2009. Retrieved September 17, 2011. ^ Sudol, Valerie. "9/11 Memorial Trees Stand Tall". nj.com. Retrieved September 6, 2011. ^ "Visitor Rules and Regulations". National September 11 Memorial & Museum. 2012. Retrieved August 15, 2012. ^ CNN Wire Staff (December 29, 2011). "Visitors to New York's 9/11 memorial top 1 million". CNN. Retrieved December 29, 2011. ^ G. Roger Denson (September 11, 2011). "Michael Arad's 9/11 Memorial 'Reflecting Absence': More Than a Metaphor Or A Monument". The Huffington Post. Retrieved December 19, 2014. ^ "Fountains of Knowledge". Siemens. Retrieved September 15, 2014. ^ Raab, Scott. "The Memorial". Esquire. Archived from the original on April 19, 2012. Retrieved March 25, 2012. ^ Matson, John. "Commemorative Calculus: How an Algorithm Helped Arrange the Names on the 9/11 Memorial". Scientific American. Retrieved March 25, 2012. ^ Blais, Allison (2011). A Place of Remembrance. National Geographic Society. p. 180. ISBN 978-1-4262-0807-2. Archived from the original on November 5, 2014. ^ Dunlap, David (May 4, 2011). "Constructing a Story, With 2,982 Names". The New York Times. Retrieved March 25, 2012. ^ a b c d Reynolds, Aline. "One survivor from 9/11 returns home, for good". downtown express. Archived from the original on March 4, 2016. Retrieved March 17, 2012. ^ a b c d e f Shapiro, Julie. "9/11 'Survivor Tree' Spreads its Branches Over the World Trade Center Once Again". DNAinfo. Archived from the original on March 13, 2012. Retrieved March 17, 2012. ^ a b c Stephan, Adam. 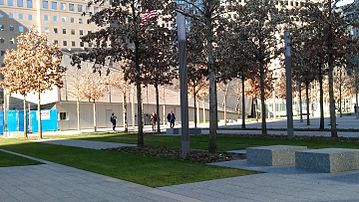 "'Survivor tree' replanted at the 9/11 Memorial Plaza". ABC – Eyewitness News. Retrieved March 17, 2012. ^ a b Strunsky, Steve. "Despite Hurricane Irene, 9/11 survivor tree emerges unscathed". The Star-Ledger. Retrieved March 17, 2012. ^ a b Dunlap, David (April 30, 2009). "A 9/11 Survivor Blossoms in the Bronx". City Room. Retrieved March 17, 2012. ^ Coleman, Steve. "DESPITE HURRICANE IRENE, WORLD TRADE CENTER PROGRESS CONTINUES; 9/11 MEMORIAL REMAINS ON TRACK FOR SEPTEMBER 11 OPENING". Port Authority of New York & New Jersey. Retrieved March 17, 2012. ^ Blais, Allison (2011). A Place of Remembrance. National Geographic Society. p. 208. ISBN 978-1-4262-0807-2. Archived from the original on November 5, 2014. ^ Frazier, Michael. 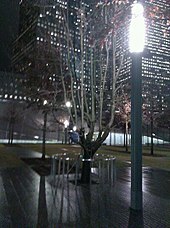 "'Survivor Tree' That Withstood 9/11 Attacks Returns to WTC to Grow on Memorial Plaza (Update X3)". The Memo Blog. National September 11 Memorial. Retrieved March 17, 2012. ^ "One survivor from 9/11 returns home, for good". Downtownexpress.com. Archived from the original on March 4, 2016. Retrieved April 4, 2014. ^ "New memorial design honoring 9/11 victims who died in years after attack unveiled". AOL.com. May 30, 2018. Retrieved May 31, 2018. ^ Greenwald, Alice; Stewart, Jon (May 30, 2018). "The 9/11 memorial is evolving to honor those sickened - NY Daily News". nydailynews.com. Retrieved May 31, 2018. ^ Otterman, Sharon (January 1, 2012). "Obscuring a Muslim Name, and an American's Sacrifice". New York Times. Retrieved April 21, 2014. ^ "Queens Street Being Renamed For 9/11 Hero Thought To Be Terrorist". CBS New York. February 13, 2013. Retrieved April 21, 2014. ^ a b c Briquelet, Kate (September 14, 2013). "Activists want 9/11 Memorial brochures in Arabic". New York Post. Retrieved April 21, 2014. ^ "ADC Secures Arabic Translation at the 9/11 Memorial Museum". American-Arab Anti-Discrimination Committee. November 14, 2017. Archived from the original on December 22, 2017. Retrieved December 19, 2017. ^ a b Christopher Robbins. "Photos: Inside The Moving 9/11 Museum Dedication". Gothamist. Archived from the original on May 17, 2014. Retrieved May 18, 2014. ^ a b "Obama, 9/11 families, first responders attend museum dedication". CNN.com. Retrieved May 18, 2014. ^ a b "Victims' relatives, Obama to dedicate 9/11 memorial museum". Fox News. October 1, 2006. Retrieved May 18, 2014. ^ a b Feeney, Sheila A. (May 21, 2014). "9/11 Memorial Museum opens to the public". AM New York. Retrieved May 21, 2014. ^ "Money Fight Puts Hold On 9/11 Museum". CBS News. December 16, 2011. Retrieved October 27, 2017. ^ "Financial dispute delays 9/11 museum opening". Reuters. December 30, 2011. Retrieved October 27, 2017. ^ "Lower Manhattan: National Sep. 11 Memorial and Museum Construction Updates". Lower Manhattan Construction Command Center. Archived from the original on February 4, 2013. Retrieved February 3, 2013. ^ "9/11 museum to open May 21, offer preview to families and first responders affected by WTC attacks". New York: NY Daily News. March 24, 2014. Retrieved April 4, 2014. ^ "National 9/11 Memorial Museum to open in May | New York Post". Nypost.com. Associated Press. March 24, 2014. Retrieved April 4, 2014. ^ Susman, Tina (January 25, 2014). "9/11 museum's admission fee stirs ire". Los Angeles Times. Retrieved May 15, 2014. ^ a b Peltz, Jennifer (May 21, 2014). "Tissues, Counselors Help Ease Pain at 9/11 Museum". ABC News. Associated Press. Retrieved May 21, 2014. ^ Staff writers (May 21, 2014). "9/11 Memorial & Museum opens to the public". New York Post. Retrieved September 8, 2014. ^ "National 9/11 flag unfurled at World Trade Center museum opening". Record Online. Associated Press. May 21, 2014. Retrieved September 8, 2014. ^ a b "National 9/11 Flag Unfurled as Museum Opens to the Public". NBC New York. May 21, 2014. Retrieved September 8, 2014. ^ Li, David K. (May 21, 2014). "9/11 museum opens on Wednesday, no tickets available until Thursday". New York Post. Retrieved May 21, 2014. ^ a b Fraser-Chanpong, Hannah (May 21, 2014). "9/11 museum designed to evoke memories without causing fresh pain". CBS News. Retrieved May 21, 2014. ^ Erlanger, Steven (October 15, 2011). "Again in Norway, Events Provide Test for a King's Mettle". New York Times. Retrieved October 16, 2011. ^ Edward, Keegan. "National September 11 Memorial Museum". Architect Magazine. Retrieved December 22, 2014. ^ "National September 11 Memorial & Museum, Build the Memorial". National911memorial.org. Archived from the original on February 23, 2009. ^ James Glanz (November 23, 2003). "The World; Ahead of Any 9/11 Memorial, a Wall Bears Witness". The New York Times. Retrieved May 19, 2010. ^ "The 9/11 Memorial Tribute Walking Tour". The Huffington Post. August 19, 2012. Retrieved June 8, 2016. ^ David Dunlap (January 1, 2013). "Little Syria (Now Tiny Syria) Finds New Advocates". The New York Times. Retrieved May 19, 2013. ^ Carol Kuruvilla (May 18, 2013). "Activists seek recognition of former downtown 'Little Syria' at the National September 11 Memorial Museum". The New York Daily News. Retrieved May 19, 2013. ^ Malek, Alia (October 27, 2013). "Rediscovering 'Little Syria' after the storm passed". Al Jazeera. ^ Fine, Todd (February 26, 2015). "Joseph Svehlak’s Advocacy for ‘Little Syria’ and Washington Street". The Huffington Post. ^ Star-Ledger, Steve Strunsky/The (May 14, 2014). "Bloomberg says people upset about $24 fee to enter 9/11 museum, should 'write your congressman'". NJ.com. Retrieved May 15, 2014. ^ "Hamill: The National September 11 Memorial & Museum should be free to all". NY Daily News. New York. May 18, 2014. Retrieved May 21, 2014. ^ Ben Yakas (September 11, 2001). "Families, New York Post Offended By 'Crass, Insensitive' 9/11 Museum Gift Shop". Gothamist. Archived from the original on May 19, 2014. Retrieved May 19, 2014. ^ Edelman, Susan (May 18, 2014). "The 9/11 museum's absurd gift shop | New York Post". Nypost.com. Retrieved May 19, 2014. ^ "9/11 Memorial Museum's gift shop sparks outrage with some families". CNN.com. Retrieved May 21, 2014. ^ Phillip, Abby (September 11, 2001). "Families infuriated by 'crass commercialism' of 9/11 Museum gift shop". Washingtonpost.com. Retrieved May 21, 2014. ^ Prendergast, Daniel (May 19, 2014). "Politicians rip crass 9/11 museum gift shop | New York Post". Nypost.com. Retrieved May 21, 2014. ^ Rousseau, Morgan (September 11, 2001). "Families outraged by 9/11 Museum gift shop". Metro.us. Archived from the original on May 21, 2014. Retrieved May 21, 2014. ^ Collman, Ashley (May 18, 2014). "9/11 museum's tacky gift shop outrages victims' families | Mail Online". London: Dailymail.co.uk. Retrieved May 21, 2014. ^ Benedictus, Leo (August 24, 2011). "Are the 9/11 museum's commemorative toys and hoodies a step too far? | Culture". The Guardian. Retrieved May 21, 2014. ^ a b James Steve, (May 22, 2014). "9/11 Museum Opens to Outrage Over Gift Shop, Cocktail Reception". NBC News. ^ Siemaszko, Corky (May 30, 2014). "Items in 9/11 museum gift shop to be scrutinized by victims' families". NY Daily News. New York. Retrieved May 30, 2014. ^ Sandoval, Edgar; Burke, Kerry; Schapiro, Rich (May 22, 2014). "Did you enjoy having drinks on top of my brother's grave last night?". Daily News (New York). pp. 1, 4-5. ^ Fermino, Jennifer; Freidman, Dan (May 22, 2014). "A WTC Sacrilege". Daily News (New York). pp. 4-5. ^ Li, David K. (May 21, 2014). "In bad taste: 9/11 museum opening Danny Meyer restaurant". New York Post. Retrieved May 22, 2014. ^ "Restaurant at 9/11 museum stirs controversy". Today. May 22, 2014. ^ Mullen, Matt (May 21, 2014). "Dining and Whining: Danny Meyer to Open Restaurant at 9/11 Museum". New York Observer. ^ Stepansky, Joseph; Badia, Erik; McShane, Larry (May 11, 2014). "The Anger Remains". Daily News (New York). p. 4. ^ Debra Burlingame (June 8, 2005). "The Great Ground Zero Heist". Wall Street Journal. Archived from the original on May 8, 2010. ^ Dunlap, David (September 29, 2005). "Governor Bars Freedom Center at Ground Zero". The New York Times. Retrieved July 9, 2015. ^ "A Sense of Proportion at Ground Zero". The New York Times. July 29, 2005. Retrieved May 5, 2010. ^ "World Trade Center steel to be part of Cedar Rapids 9/11 ceremony". The Gazette. September 9, 2011. Archived from the original on July 17, 2012. Wikimedia Commons has media related to National September 11 Memorial & Museum.